PAVBHAJI BURRITOS Bundles of joy, oodles of fun. You are all the things I love, rolled into one. 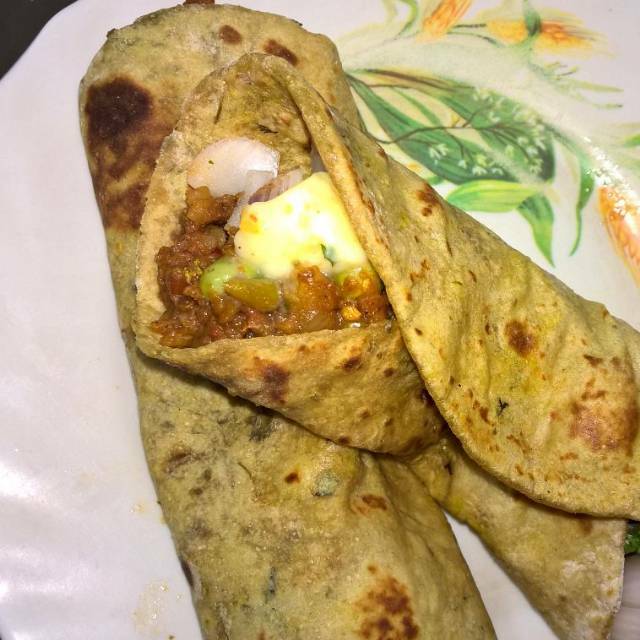 I am in Love with these delicious Pavbhaji Burritos. Pav bhaji is a fast food dish from Maharashtra, India, consisting of a vegetable curry served with a soft bread roll. Pav Bhaji is now offered at outlets from simple hand carts to formal restaurants in India and abroad. A Burrito is a type of Mexican and Tex-Mex food, consisting of a wheat flour tortilla wrapped or folded into a cylindrical shape to completely enclose the filling. The flour tortilla is usually lightly grilled to soften it. 2 pinches of turmeric powder and ½ tsp ginger & garlic paste in a small bowl and make a soft dough. Divide into 3 or 4 balls. Heat a non stick tava, add a little butter and make a round shape like rotis and fry on pan. When bubbles appear, turn the rotis both sides till done. Keep aside. Boil the cauliflower, French beans, potatoes and carrots till they are soft. Boil green peas separately till soft. Heat the butter and oil in a flat tava or non-stick pan, add cumin seeds. When cumin crackles add the finely chopped onion, tomato and coriander leaves and sauté for 2 minutes. Add ginger-garlic paste and sauté till the raw smell disappears. Add the chopped fresh capsicum and mix it. Simmer the gas on low flame till the oil separates. Add the all the boiled vegetables and mash thoroughly using a potato masher. Place all the potatoes on the sides of the pan and create a well. In the center of the pan, add butter 2 tbsp and add coriander powder, chili powder, pav-bhaji masala, salt and few drops of lemon and cook for 2 minutes. Mix all the potato mix and fried masala together. Cook stirring continuously for 3 mins. In a bowl mix 1 chopped onion, a pinch of chat masala and chopped fresh coriander leaves 1tsp. 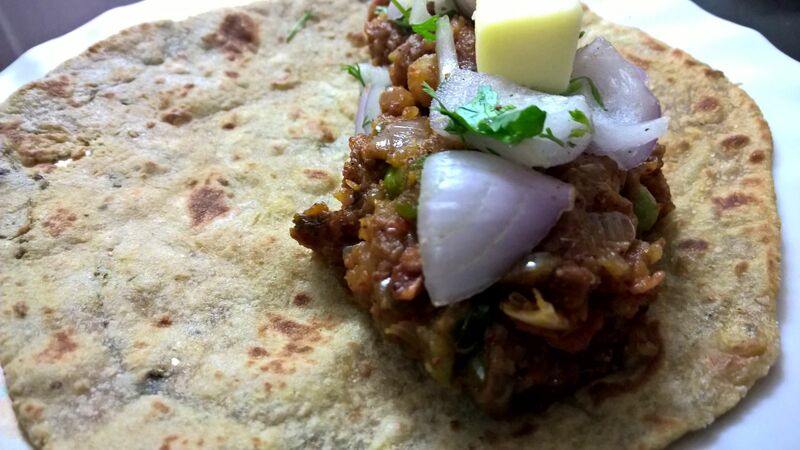 Place the methi roti on a plate and add the pavbhaji mix on one side of the roti. Sprinkle veg salad on top of it. Add a dollop of Amul butter and flip the roti into a roll. Add a toothpick in between of the roti as desired(optional).Enjoy! !